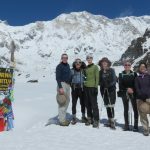 For many years the Annapurna Circuit trek enjoyed the status of the world’s best trek. That changed when a jeep track was built connecting Besi-Sahar to Manang and Muktinath to Beni. 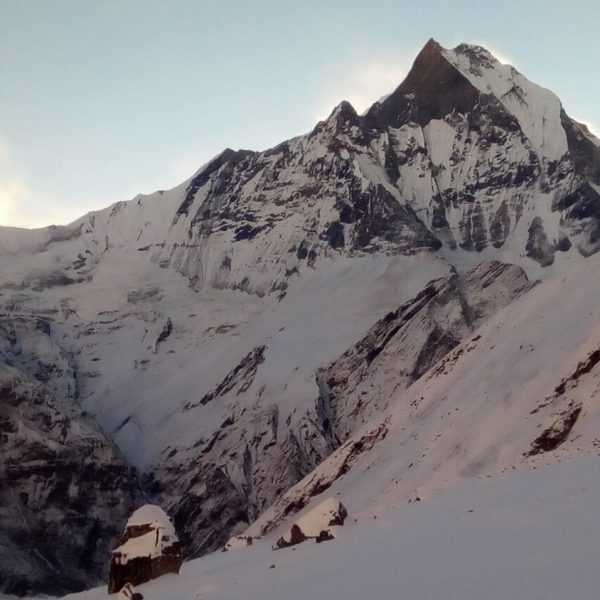 Now, local entrepreneurs have begun building lodges along the Manaslu Circuit route and this trek is fast becoming popular and for many it is the new Annapurna Circuit Trek. The trip takes you to the remote and less-frequented circuit around Manaslu – the world’s seventh highest mountain at 8,156m. 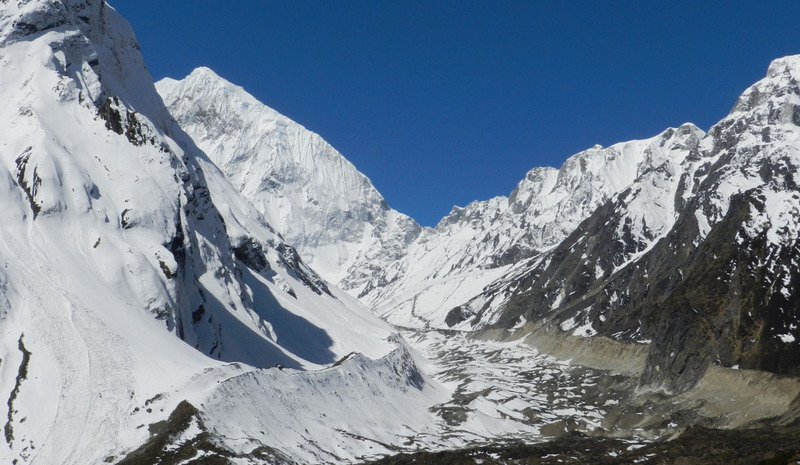 The Manaslu region, located along the border of Nepal and Tibet, is both beautiful and fascinating. The trek is fairly long, but the rewards are well worth the commitment. 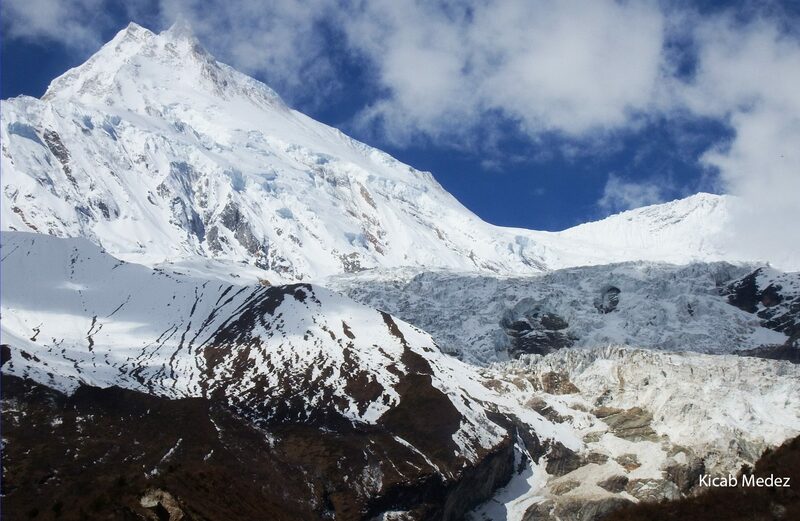 The Manaslu area has been opened for trekking only since 1991. In addition to a Conservation Area fee, a restricted area fee is also required for this region. This trek is geographically spectacularand culturally fascinating. 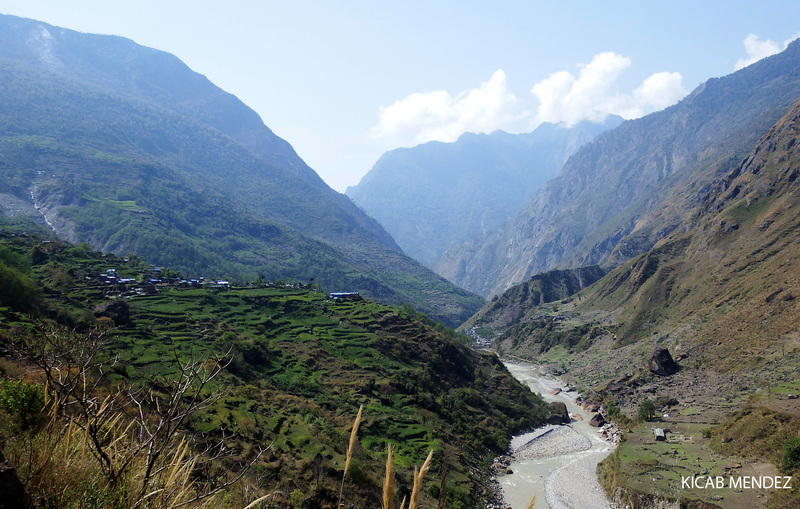 The inhabitants of the lower Buri Ganadaki region are Hindus (Brahmin/Chhetris) and Gurungs (Bonpos and Buddhists), while the inhabitants in the upper parts of the Buri Gandaki river are Buddhists and direct descendants of Tibetan immigrants who settled here in the early 1600s. The mani stone around Ghap (6,800ft) are particularly outstanding. 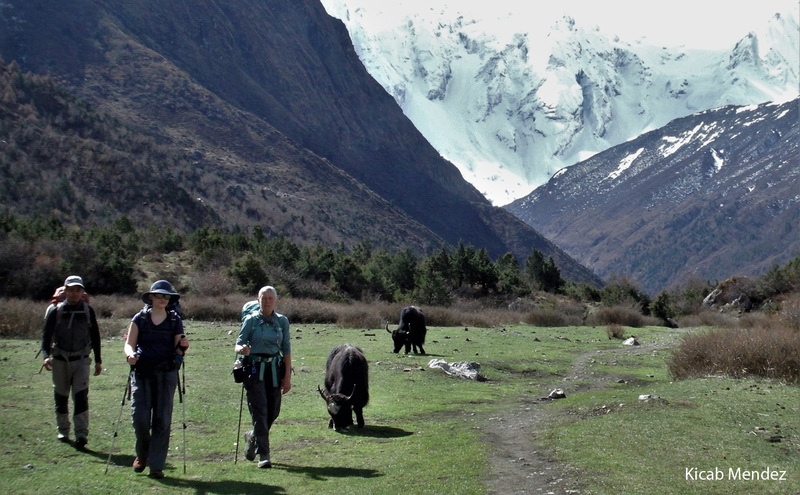 A day beyond Ghap, you will enter truly high Alpine country with spectacular close-up views of Manaslu at the head of the valley. The high pass of Larkya La (16,700ft) is one of the most dramatic pass-crossing in the Himalaya. 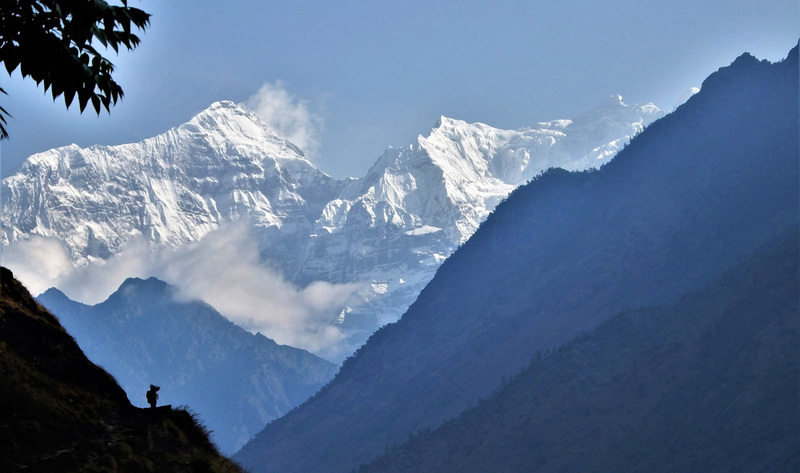 Crystal Mountain Treks operates treks and climbs in Nepal and Tibet. Crystal Mountain Treks has been in business for over two decades and employs only the best guides with a minimum of 15 years experience. We treat our staff with the utmost care and respect. Each staff member is provided high-quality equipment and paid higher-than-average wages. Our clients have commented that our treks provide a better value (we provide more for less) than other companies they researched, comparing services, quality and price. We are happy to provide references of people who have journeyed with us in the past upon request. 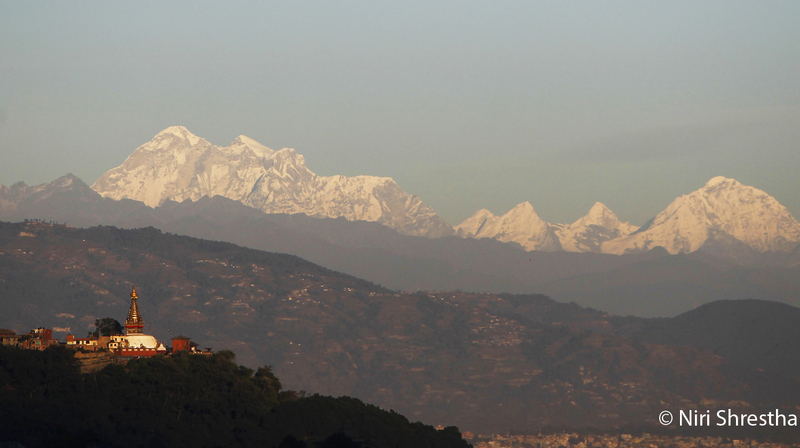 Explore monasteries and palaces in the Kathmandu valley. 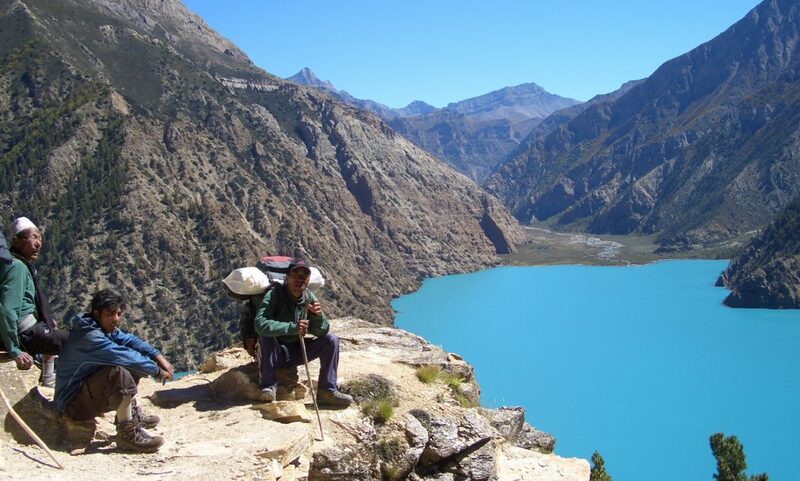 Experience Nepal’s varied landscape: Lush lowlands and alpine highlands. Circle Manaslu the eight highest mountain in the world and cross beautiful Larkya la pass at 5090m/16,700 ft. Arrive Kathmandu. You will be met on arrival at the Tribhuwan International Airport. Transfer to Hotel. Day Free. Enjoy welcome dinner. Briefing during dinner. Visit Pashupatinath, Nepal’s most sacred Hindu temple dedicateed to Shiva, with its two-tiered golden roof and silver door. Here, you’ll probably witness a Hindu cremation along the banks of the Bagmati River. Then drive to Bhaktapur, the city of Devotees, for lunch and a tour of the royal palace square. Bhaktapur is a medieval city inn the Kathmandu valley and is least disturbed by modern life. Here, you can absorb the architectural splendor of the five-storied Nyatapola temple, or the sculptural delight of the Peacock Window. Overnight Hotel Tibet or similar. Board a chartered bus to Arughat. We follow the Trishuli river on paved highway for about three hours and then head north on the bumpy jeep track at Dhading Besi. Arughat is a good size settlement by the Budi Gandaki river where your permits will be checked at the police station. Continue for another hour towards Soti Khola. The total drive can take up to 9 hours. 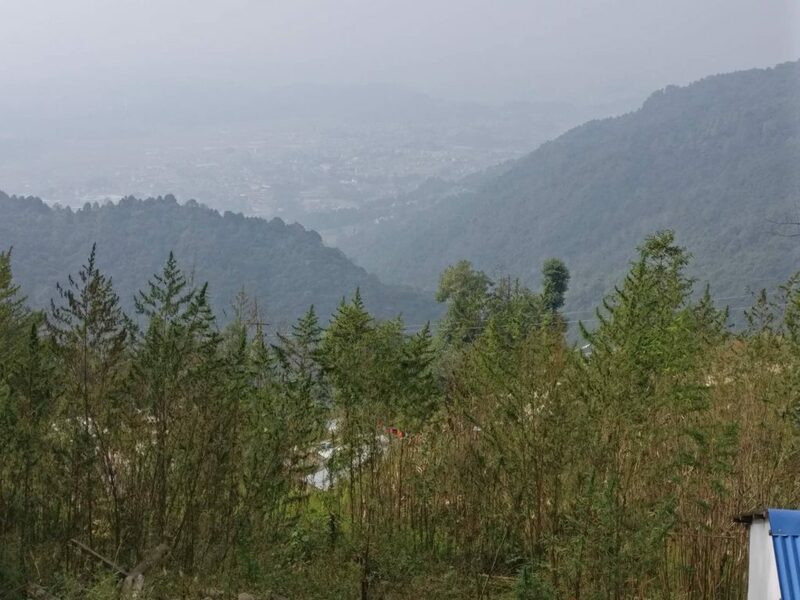 From Soti Khola, walk through the low hills with terraced rice fields through villages inhabited by the Brahmin and Chettri ethnic groups enroute to Machha Khola. As you gain elevation, the fields slowly change to wheat and buckwheat fields near the hot-springs at Tatopani (930m/3,051ft). You are welcome to spend some time soaking in the hot-springs before heading out to Dobhan (1,000m/3,280ft). Above Dobhan, the Buri Gandaki descends in an impressive series of steep rapids. Here, the trail climbs high above the river and then descends through a huge gateway that opens out into a wide valley where the river is calm again. Continue on to the campsite below Jagat (1,410m/4,625ft). 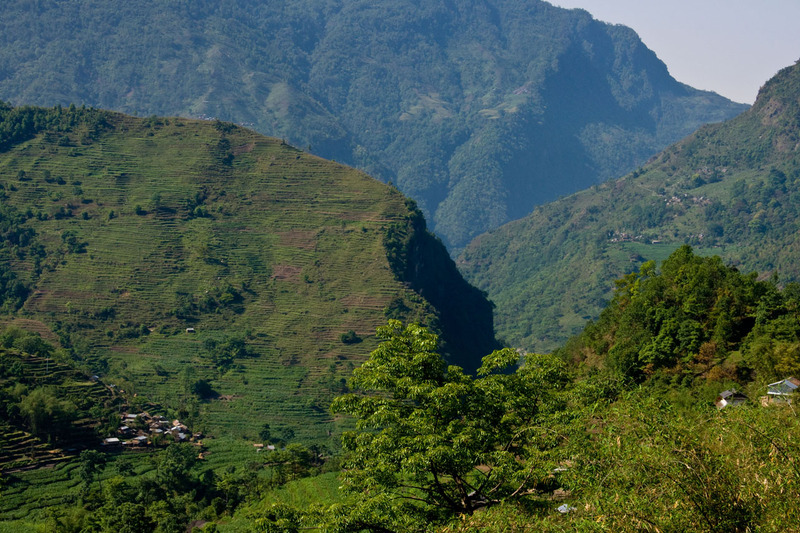 Jagat is a beautiful stone-paved village with a rudimentary trekker’s hotel, shops, and a customs office. 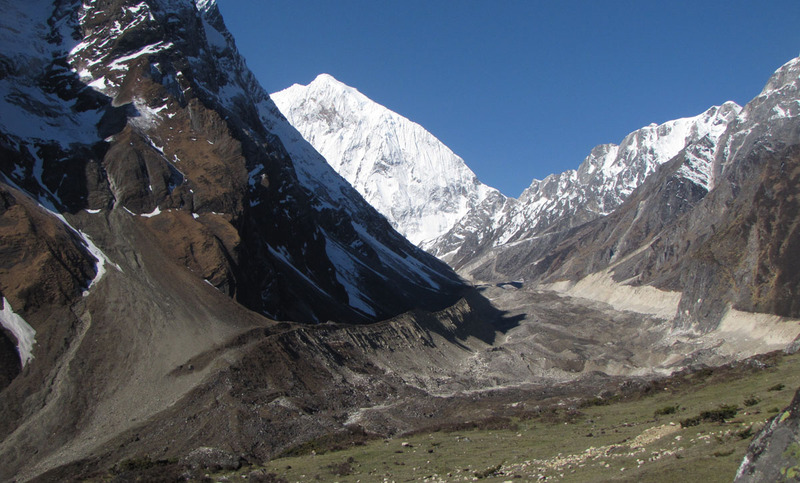 Jagat is the entrance to Manaslu Conservation Area, an area where the concept of integrated conservation and development is being implemented to achieve conservation and sustainable development objectives. 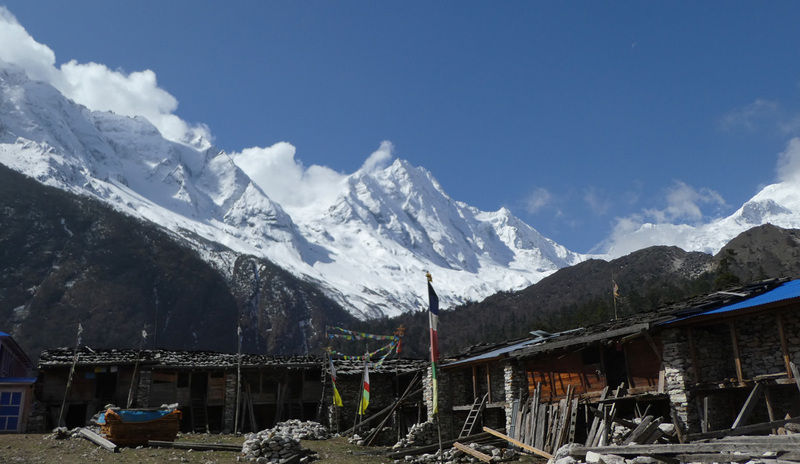 There is also an MCAP (Manaslu Conservation Area Project) office here where your permits will be checked. 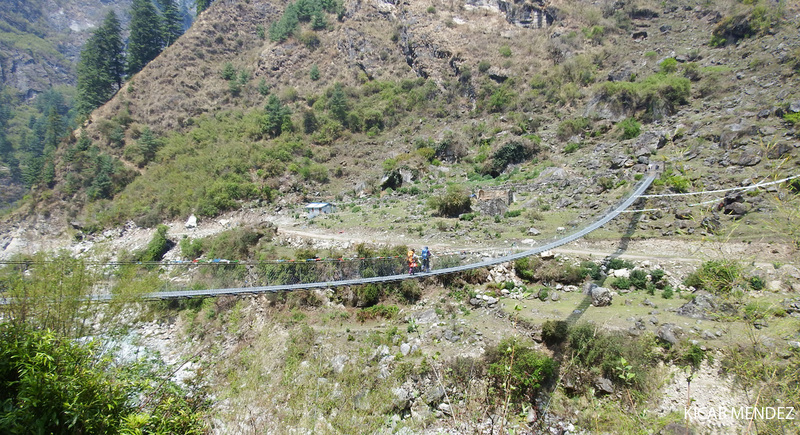 Cross the Buri Gandaki again over a long suspension bridge at Ghatta Khola, then follow the route ustream. Climb up a steep incline to reach Philim (1,590m/5,216ft). Philim is a large Gurung village with fields of corn and millet. The hillsides become steeper beyond Philm until Aga. Trek through a narrow, dramatic gorge with towering walls, and past a thundering waterfall. 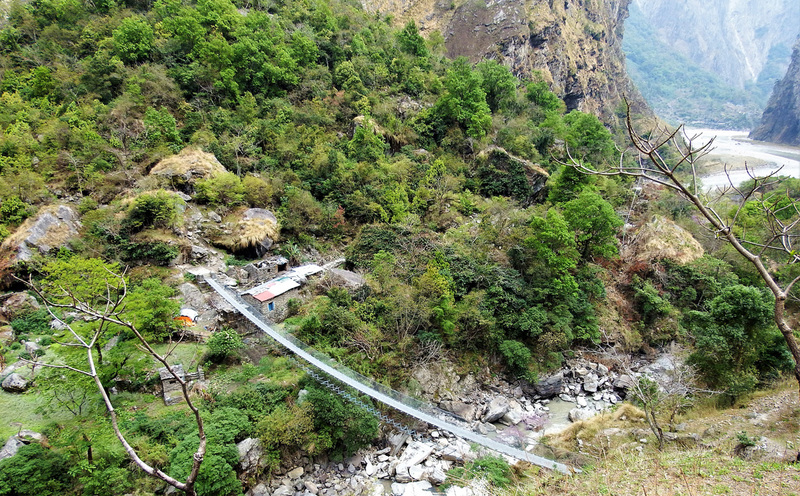 Cross the river on locally-built bridges and then leave the gorge to climb to the small village of Deng (1,800m/5,905ft). The ‘Nupri’ region starts here at Deng. Nupri translates to “the Western Mountains” and the people of Nupri are direct descendants of Tibetans immigrants who settled here in the 1600s. Cross the Buri Gandaki again into the north bank and climb to the village of Rana (1,980m/6,496ft). 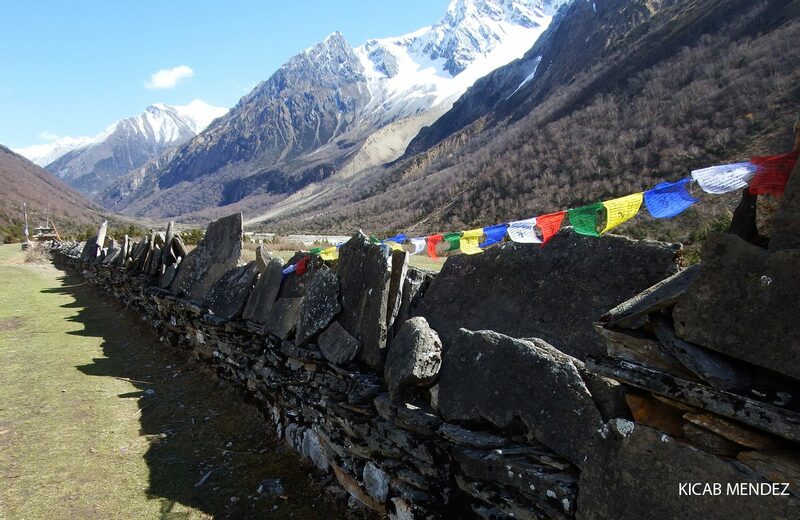 Here, you wil start observing Mani walls (stones carved with prayers on their surface and stacked to form a wall) – a sign of Tibetan Buddhism being practiced in the area. The trail is level, then climbs and drops and climbs again to the village of Ghap (2,110m/6,922ft). Here you will also walk throiugh a kaani – an archway over the trail decorated with paintings or carvings on the inside. The mani wall in Ghap has elegant carvings said to have been made by a family of stone carvers from Bhi, hig on the hillside above the village. Many of the carvings depict the Buddha in various meditative poses, and others are of Milarepa – The Tibetan hermit who traveled and meditated in this valley. 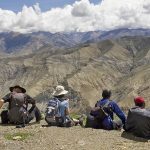 Walk through barley fields lined with mani walls and continue towards a fir forest, where you might catch sight of the Danphe – impeyan pheasant which is also Nepal’s colorful National bird. 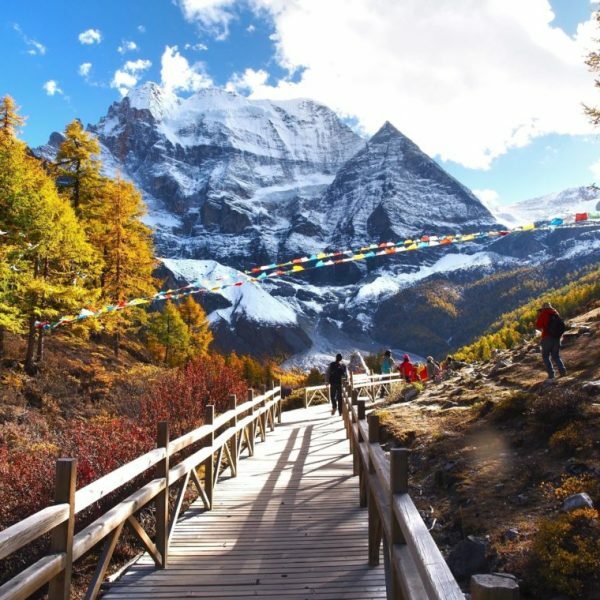 Continue climbing into a dense, rhododendron-fir forest and enter Namrung (2,660m/8,727ft) through a stone kaani arch. 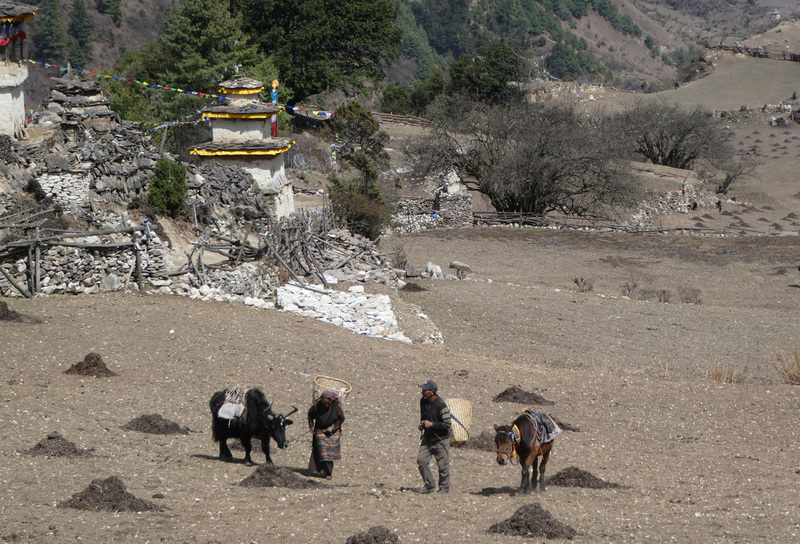 Beyond Namrung, the trail enters upper Nupri where the residents are of Tibetan origin. Climb past a mani wall and the many fields and houses of Barsam, then up through a fir-rhododendron-oak forest to a promontory. The trail passes through another stone kaani and enters Lihi (2,900m/9,514ft). Lho is a closely-packed village with unusual architecture: the stone houses are grouped together into units of five or six that share a common roof and courtyard. Most roofs are made of heavy wood shingles. Head towards Sho (2,960m/9,711ft), whose closely-paced houses you can see on the ridge ahead. From Sho, the views of Ngadi Chuli are spectacular. From here onwards, you will also encounter who may hassle you for shim shim- i.e. sweets or candy. 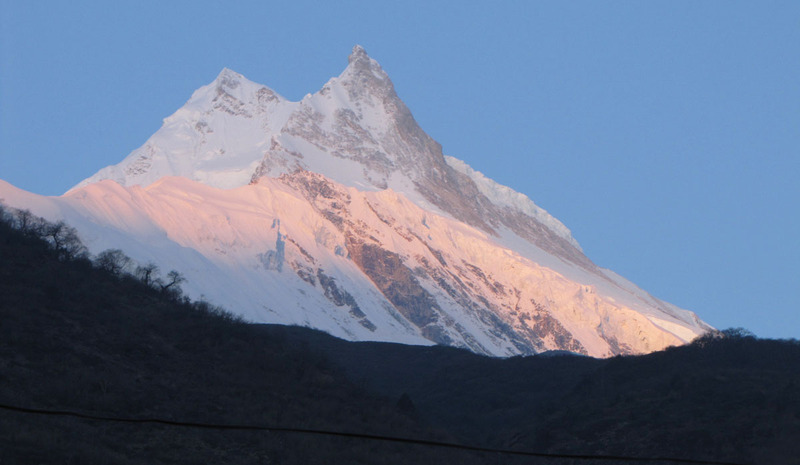 From Sho onwards, and towards Lho (3,180m/10,433ft), you will also start viewing Manaslu. 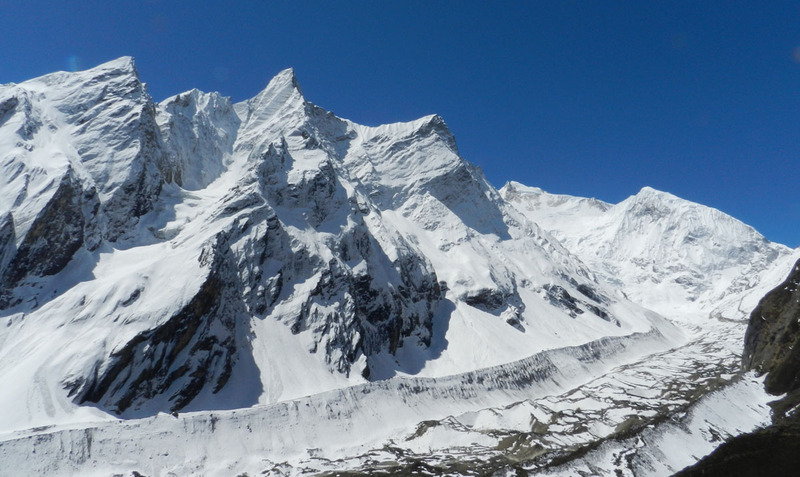 Manaslu north (7,157m/23,480ft) and Nalike Peak (5,5515m/18,093ft). 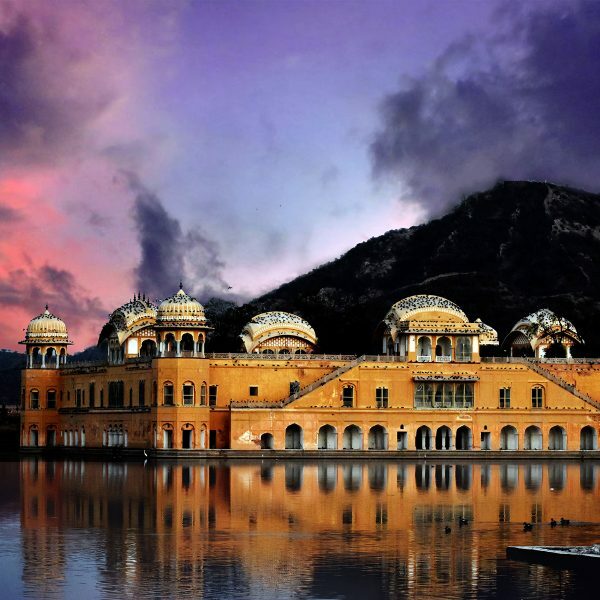 Samagaon – or Ro, as the locals call it – sits in a bowl at the foot of the pastures leading to high peaks. There are two gompas (monasteries) here with unique architecture. The residents of Samagaon are Tibetan descendents, and they continue to maintain an active trade with Tibetans across the border. 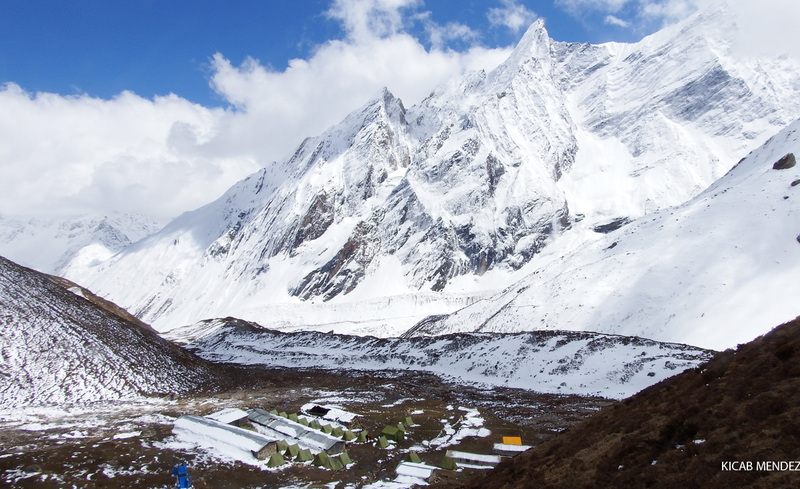 A lay over day is planned at Samagaon during which you can trek towards the Manaslu Base Camp. 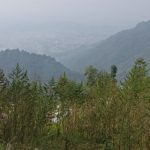 Trek to Samdo. Another layover day is planned at Samdo for exploration and acclimatization. Trek to the base of Larkya la pass. This is a short day of around 3 hours. Retire to bed early to prepare for an early and long pass crossing day. Since rooms are limited, it is possible that you might have to sleep at the semi-permanent tents set up by the lodge owner. Camp is at 4,480m/14,700ft. Wake up early to begin the crossing of Larkya la (5,100m/16,700ft). The guide will decide the exact time but most groups being at 3 – 4 am. The climb is long but gentle and mostly follows the moraine. Prayer flags and a large sign board mark the top of the pass. The descent begins with a steep descent on loose gravel but slowly becomes more gradual. The valley widens as you cross several meadows ending at a large meadow at Bimthang. This is a long strenuous day and can take anywhere between 7 to 10 hours. 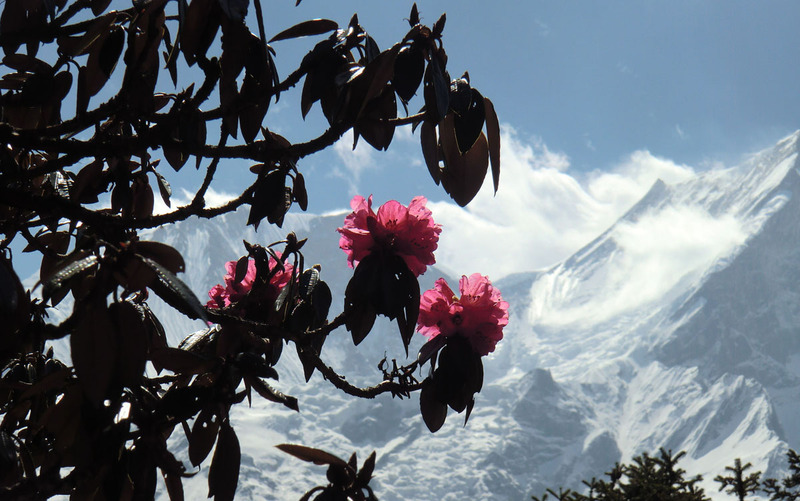 Descend through Rhododendron and oak forests to the Gurung village of Tilje. The trail joins main Annapurna Circuit trail at Dharapani. And we continue our descent through Tal to Jagat where the trek ends. 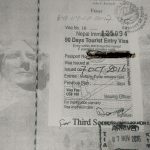 A chartered 4 x 4 will bring you to Kathmandu. The section from Syange to Besi-Sahar is on jeep track through bumpy winding roads that follow the Marsyangdi River southward. From Besi-Sahar, it is a small paved road until Dumre from where you join the main highway in Kathmandu. US$ 150 per person discount on September, May and June departures. This trek is not recommended for the Winter months of December, January and February. Balance is payable a week prior to departure. Contact us for coupon code if you are eligible for a US$150 low season discount or a US$150 alumni discount. Only one discount is applicable. No refunds for unused services once trek begins. The 19 day program is our standard program. But, for a party of two, we would be more than happy to organize a faster-paced program and reduce the total days to 17 days. 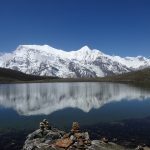 It is also possible to combine this trek with the Annapurna Circuit trek at Dharapani from where you would ascend to Manang and over the Thorung La pass instead of descending to Jagat. This would add around 6 days to the trip. 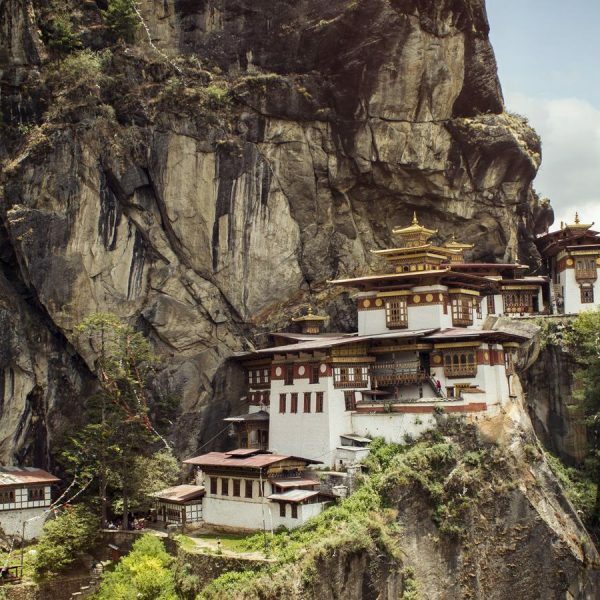 Also, do consider combining your Nepal trip with a trip to Bhutan or India. 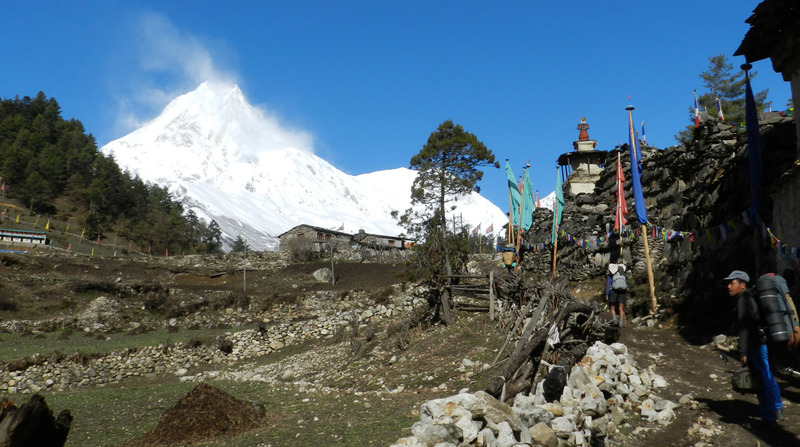 There are two preferred seasons for the Manaslu Circuit Trek: Spring (April through May) and Fall (October through November). Since this trek involves crossing a mountain pass, we recommend beginning the trek a little later in the Spring as the snow may still be a factor at the pass. (Note: other Spring treks begin in March). Also, we do not recommend doing this trek in December as storms can dump snow at that time. 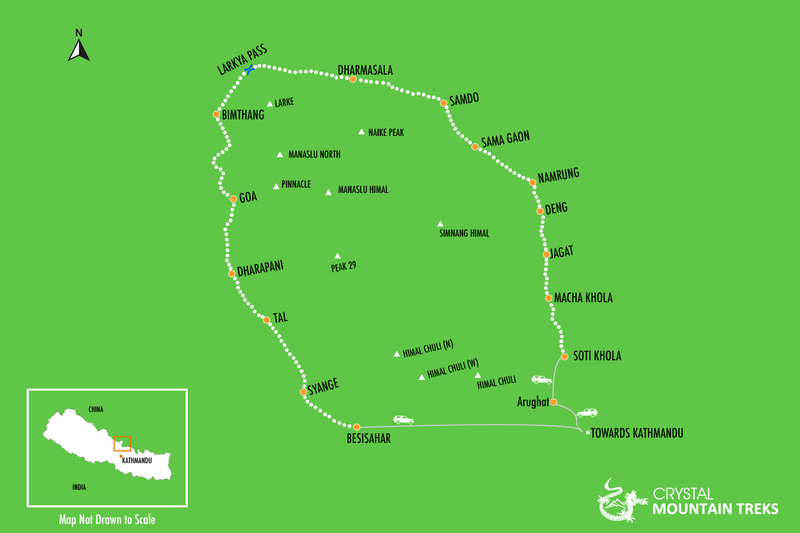 The trek begins at low elevations with sub-tropical climates and day time temperatures can reach the 80’s in humid conditions. Once you get a little higher, day time temperatures range in the 50’s and 60’s (10 to 15 Centigrade) while night-time temperatures are in the 30’s and 40’s (0 to 5 Centigrade). Expect night time temperatures of below Freezing past Sama Gaon. And expect some late-afternoon showers in the Spring which is the season for rhododendrons and magnolias. October is historically regarded as the best month to trek with clear skies and better views of the mountains. or micro-spikes are a good idea. It is advised that anyone with a pre-existing condition consult their doctor before signing up for a trek. 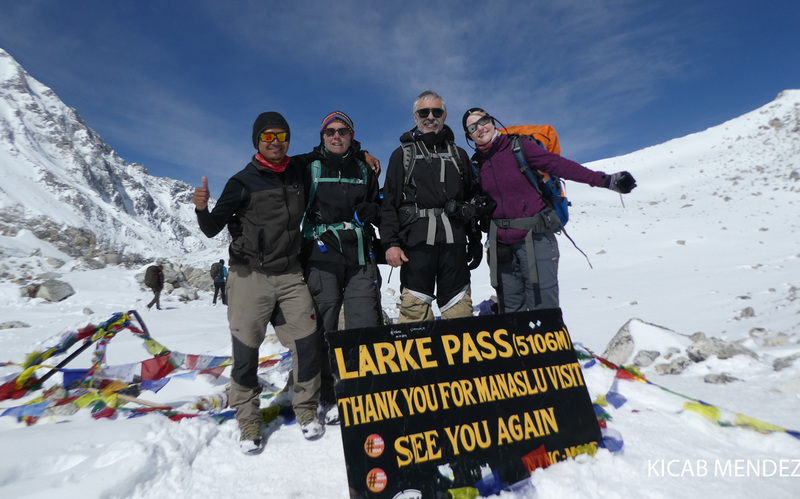 We rate the Manaslu Circuit Trek a 5 on a scale of 1 (easy) to 5 (challenging). 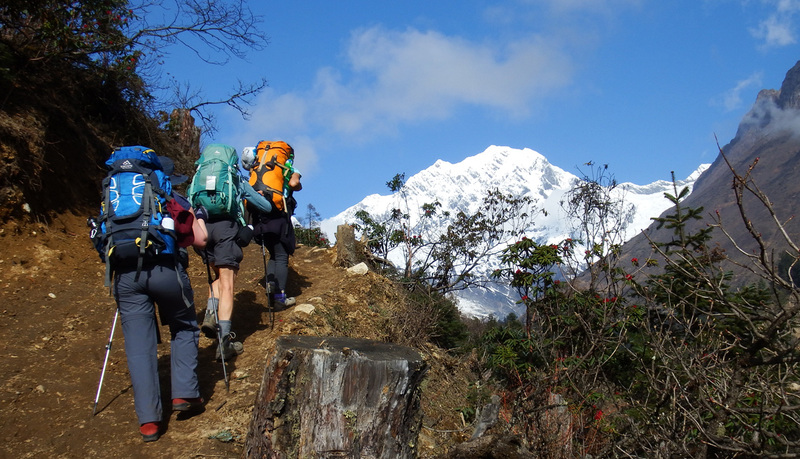 Can a beginner do the Manaslu Circuit Trek? There are two aspects to completing and enjoying a trek: Physical and Mental. 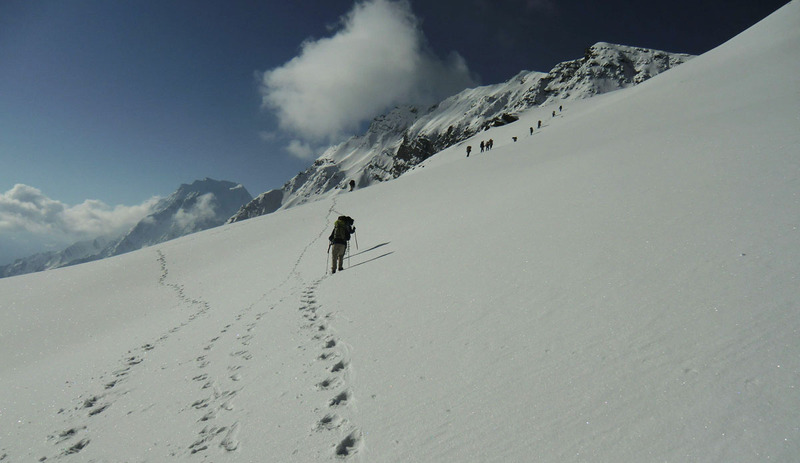 The daily mileage covered on a moderately-paced Manaslu Trek isn’t too challenging for anyone in good physical shape as you would only have to walk up to 8 miles per day (slightly longer on the pass day). But on the mental side, it’s a good idea to establish that you like hiking and don’t mind basic conditions, so that you can actually enjoy the experience when you do it. What kind of food should I expect on the Manaslu Circuit Trek? Meals on the Manaslu Circuit trek are slightly more basic compared to that on the Everest Base Camp Trek. In general, expect porridge (Oatmeal), toast, eggs (any style), muesli, hash browns etc for breakfast. And sandwich, pizzas, momos, noodles (dry and with soup), rolls, fried rice, Indian bread with vegetables etc for lunch and dinner. Nepali dal-bhat (rice-lentils with vegetables and/or meat) is a staple at all the lodges. Ours is an OPEN menu. Meaning we allow our clients to order anything from the lodge menu besides bottled beverages, specialty coffee and packaged snacks. We also don’t limit the number of items per meal as long as you aren’t wasteful. When choosing your trekking company, ask if meals are fixed or if you are only allowed to order one item from the menu. If this isn’t the case, costs can add up over 15/16 days. 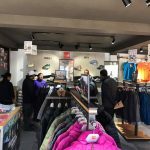 What gear do I need for the trek? Can I purchase/rent some in Kathmandu? Can I drink tap water on the trek? Nepali tap water is NOT safe to drink. Even if you see the locals drinking water straight from the tap, never drink water before boiling or sterilizing. Bring water purifying tablets or other water purifiers. At higher elevations during the coldest times of year the water will freeze, so you’ll need to buy boiled water from teahouses. If you plan to use a STERIPEN, bring wide mouth water bottles. You would need at least 2 one-liter water bottles for the trek. Even if you plan to bring a hydration pack, bring 1 one-liter water to sterilize the water before pouring into your hydration pack. Crystal Mountain Treks will provide you with a Steripen to use on the trek for no charge. 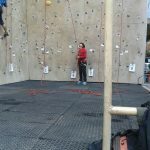 How should I prepare for the trek? What are the toilet facilities like on the trek? Will I have a chance to take a shower? Most tea houses have a common toilet. Some tea houses, especially those at the beginning of the trek, have en suite rooms. While squat toilets are more prevalent, newer lodges have Western style toilets. It is possible to shower in almost all the lodges. And hot shower usually means a bucket of boiled water. Be prepared to pay anywhere from $2-$5 for this service. Crystal Mountain Treks provided comprehensive pre-trip information. Staff was incredibly well cared for with appropriate gear. We experienced the 7.8 magnitude earthquake after crossing Larke La Pass on the Manaslu Circuit Trek. Many other trekkers were left to figure out logistics on their own, whereas Crystal Mountain staff remained with us. There was little available information following the earthquake, but staff was able to communicate with other Nepalis to figure out our safest plan. We are forever grateful to Crystal Mountain for an incredible adventure and for surviving an intense experience together. 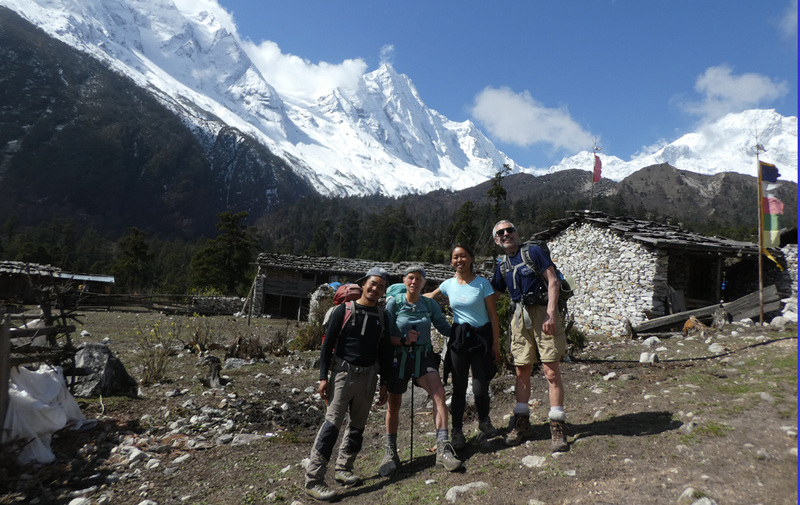 Rajbeir, Sune, Khadga, and Padum were constantly professional through our entire trek. go with, when I can succumb to the inevitable desire to return. Just want to reiterate how much I enjoyed the spring trek on the Manaslu circuit with the Ganesh and Tsum valley extentions. 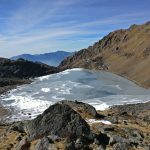 After several Autumn treks in Nepal, my first spring trek more than met my expectations. The diverse scenery, flora and fauna were all glorious, especially the rhododenron in bloom. The cultural diversity encountered on this trek was also fascinating. The entire crew provided by CMT was first-rate in all respects They were always eager to please, and in several instances provided service above and beyond the call of duty; ever watchful of our welfare and safety. I must also say that our Head Cook (Manju Rai) proved exemplary in the culinary department, providing hearty and tasty meals. From wake-up tea in my tent in the morning to goodnight tea in the dining tent each evening it was always “service with a smile”. CMT is a well-run, well-organized company that charges reasonable fees for it’s services. I would recommend them to anyone interested in Asian treks and tours.